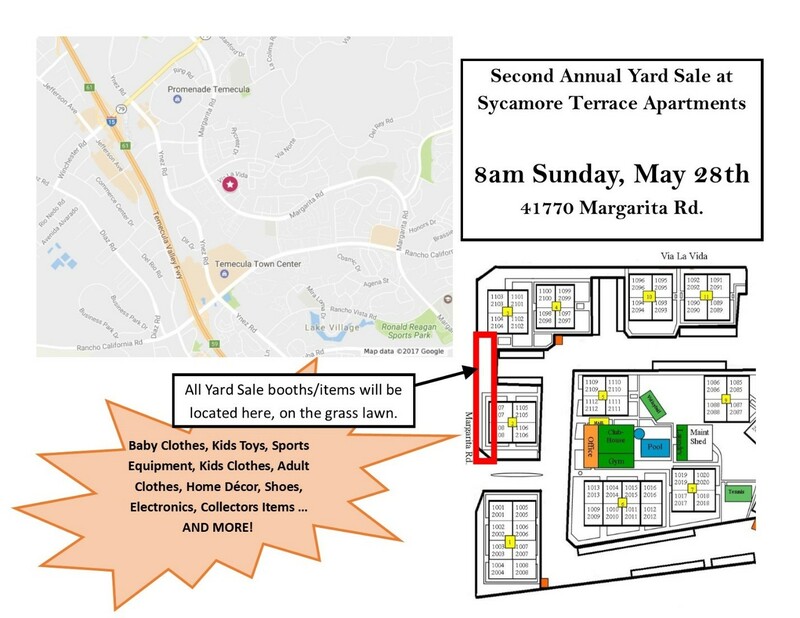 Temecula, California (March 17, 2017) – Sycamore Terrace Apartments in Temecula, CA is having another Community-Wide Yard Sale on Sunday, May 28th. Throughout the years of living in Sycamore Terrace Apartments, residents would have likely accumulated items that could cause their homes to feel cramped. In an attempt to help families keep their apartments more organized, the management staff has come up with this solution. Now in its second year, the Community Yard Sale has become a great way for residents to de-clutter and socialize with other guests or even the staff. 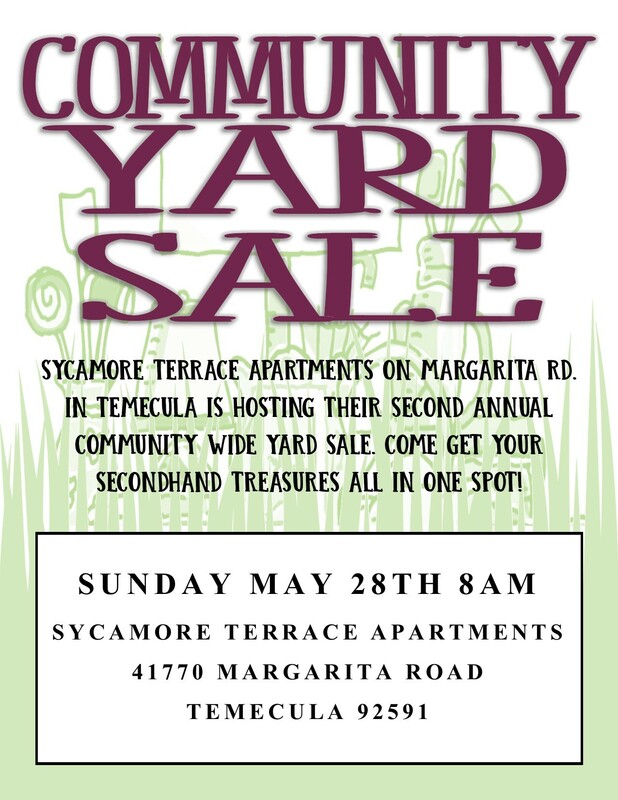 The yard sale is also open to the Temecula at-large community as well, so tell all your friends and family to come to Sycamore Terrace Apartments on May 28th! Guests can take this opportunity to shop around, and the yard sale is the ideal place to find new treasures. Residents who are in the mood for a spree might just spot some great finds that their neighbors are willing to part with. Yard sale booths will offer baby and kid’s clothes, adult clothes and shoes. There will also be sports equipment, electronics, home décor, and collectors’ items on sale. With some space cleared up, residents will have no trouble bringing in new items they find from the yard. All yard sale booths and items that are up for grabs will be in one location for a more convenient shopping experience. Simply proceed to the grass lawn area near Margarita Road or consult the map provided here for detailed directions. The event starts at 8 AM and will go at least till noon to give guests enough time to look around. It’s a family friendly event too, so feel free to bring along children. There is sure to be something of value for everyone in the booths if they have the eyes for it. At the same time, the yard sale presents the chance to earn a little money on the side. Families who are planning on going away to somewhere exotic for summer vacation or people who simply want to update their summer wardrobe can make a quick buck by participating in the event. Even residents who are not looking to shop or sell any items are welcome to join in on the fun. Sycamore Terrace Apartments’ lawns, with their manicured landscaping and park-like feel, are meant to be enjoyed by everyone, after all. Sycamore Terrace Apartments offers residents in Temecula the best one- and two- bedroom apartments, management services and a taste of the great California lifestyle. The community comes with a host of amenities like spas, pools, a fitness center, children’s playground and more.